Foot-and-mouth disease has returned to Surrey, where an outbreak occurred in August. In 2001, a major outbreak hit the UK which saw about seven million animals slaughtered and caused devastation for many farms and rural businesses. Foot-and-mouth is a virus which affects animals - very few human cases have ever been recorded. It is endemic in animals in many parts of the world including Asia, Africa, the Middle East and South America. The disease affects cloven-hoofed animals, in particular cattle, sheep, pigs, goats and deer. Other animals that can be affected include llamas and alpacas, some wild animals such as hedgehogs and coypu, any wild cloven-footed animals including deer, and zoo animals such as elephants. It has serious implications for animal health and for the economics of the livestock industry. There are seven different foot-and-mouth disease types - O, A, C, SAT-1, SAT-2, SAT-3 and Asia-1. They show some regionality, with the O type most common. Foot-and-mouth disease cannot be cured and usually lasts for two to three weeks before the animal recovers naturally. How does it affect the animals? The disease causes fever followed by the appearance blisters, mostly affecting the mouth and feet. It is rare for the disease to be fatal, but it can cause death in very young animals - which may not show any symptoms - or in older animals if the form of the disease is severe enough. Affected animals lose their condition and can suffer from secondary bacterial infections. In dairy cattle, milk yields will be lost and the cattle's value will be permanently reduced. Other potential effects include sterility, lameness and chronic heart disease. The disease can be spread through the air, and over long distances if the climate is right. Animals pick up the virus either by direct contact with an infected animal or contact with something which has been contaminated by an animal. It can also be spread from an infected carcase. There have been cases of the disease linked to imports of infected meat and meat products. Movements of animals, people and vehicles can assist the spread of the disease. Trucks, lorries, market places, and loading ramps need to be disinfected, and the wheels of passing vehicles can pick up the virus from contaminated roads. 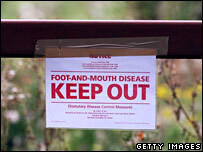 Foot-and-mouth disease crosses the species barrier to humans with very great difficulty. The Department of Health says cases of people contracting the disease are very rare. The last human case in the UK was in 1966. The cases in humans so far have been mild, short-lived, and no medical treatment has been needed. The symptoms in humans have been similar to flu, with some blisters. The Food Standards Agency says the presence of the disease in animals does not affect the human food chain. There is a condition called hand, foot and mouth disease that affects humans, but it is unrelated to animal foot-and-mouth. How is the disease contained? Animals are slaughtered because if the disease were allowed to spread across the country it would cause major problems for the farming economy and animal welfare. Once a case of foot-and-mouth is confirmed in the UK, movement restrictions are put in place to help contain the disease. Officials set up a 3km protection zone and a surveillance zone with a minimum radius of 10km. In the protection zone, the movement of animals, animal products, feed and bedding are prohibited, unless a special licence is obtained. A ban on movement across a wider area may also be introduced, and public rights of way could be closed to prevent the disease spreading. In both the protection and surveillance zones, there will be increased levels of biosecurity on farms, with disinfectant used on footwear, clothing and vehicles. Infected and other susceptible animals are valued and slaughtered. Products from animals in the prohibited zones will also be subject to treatment to ensure destruction of the foot-and-mouth disease virus. Such treatments can include the pasteurisation of milk, which is a normal process for most milk produced in the UK, as well as heat treatment or deboning and maturation of meat in certain circumstances. How does it affect farmers in terms of trade? Export health certificates for animals and animal products will be withdrawn. The European Commission is likely to ban all British milk, meat and livestock exports until the disease is contained. International restrictions are likely to be imposed on exports to countries outside the EU by the international veterinary organisation, the OIE. If a national movement ban is in place, farmers will also not be able to take animals to slaughter or market.